murdering both her rival and her own children. 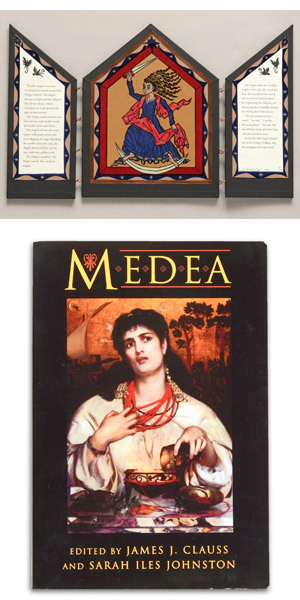 In addition to the Euripides play, the figure of Medea was often depicted in ancient times – in the writings of Pindar, Apollonius, Ovid and Seneca, and pictorially in vase painting. As well, there are modern representations, including a theatrical work by Irish playwright Brian Kennelly and an opera by the Greek composer Mikis Theodorakis. In the anthology Medea: Essays on Medea in Myth, Literature, Philosophy and Art; edited by Professor James J. Clauss and Professor Sarah Iles Johnston, the complexity of this figure is revealed in twelve essays that elaborate on the origins, influences, and the various portrayals and interpretations of the Medea story. The combined essays work together to unravel the multiplicity of characterizations of this complicated figure whose persona, unlike most figures from ancient mythology, is not consistent throughout the different versions. merciless woman who killed her own children as revenge for her husband’s infidelity. In his own essay, “Conquest of the Mephistophelian Nausicaa: Medea’s Role in Apollonius’ Redefinition of the Epic Hero,” Professor Clauss discusses Medea’s role as a helper-maiden, a familiar figure from fairytale and legend. While the helper-maiden figure is not generally one of power, Professor Clauss argues that because Jason is not the typical Greek hero – endowed with neither the cleverness of Odysseus nor the strength of Herakles – that Medea must be intelligent and powerful to so ably assist Jason in his feats. However Medea is viewed, her character is strong, resourceful and cunning. That the myth is still being discussed, represented and examined today is evidence of her remarkable and varied personae. The artists’ books paired with Professor Clauss’ volume depict, in a variety of ways, how women today negotiate – or fail to negotiate – their places in a society that often denies gender equality and looks suspiciously or fearfully upon feminine power and agency, either through intentional acts of misanthropy or through age-old accumulated habits or ordinary unthinking judgments. In The Annunciation, Jules Remedios Faye uses a traditional religious triptych format to present an allegorical tale of the Virgin Mary in a non-traditional light. This triptych retains a measure of the religious and spiritual connotations of Medieval and Renaissance altar-pieces, but its sharp-edged, extreme angularity lends it an unexpected formal aggressiveness. The central figure, instead of following in the mode of the benevolent and humble Mexican Virgen de Guadalupe on which it is based, is a fierce, sword-brandishing protectress whose hair rises up in snaky Medusa-like spikes and whose fallen mantle zigzags across her body like a lightning bolt. Like Our Lady of Guadalupe, she stands on a crescent moon against a gold-embellished background, but here the moon is no elegant sliver but a pointed, attenuated instrument that appears as threatening as the wielded sword above. No downcast eyes and modest tilt of the head for Faye’s fiery Virgin: she stares straight ahead, her intense eyes focused on vengeance. She is the epitome of female rage and power.